Juniors and Seniors: Please make sure you complete the Google Form Prom Survey no later than tomorrow. See Mrs. Meller or your English teacher if you need the link to complete the online survey. Your input is valuable to planning for next year’s prom. There will be a lunch bunch meeting today at lunch. Tomorrow’s Activity period is for all current Spanish students to discuss cinco de mayo. Please meet in the theater during activity period. High School FCA will meet in room 150 today at lunch. The NHS will be hosting a Mariokart tournament at lunch from April 23-May 4. Bring a new pair of socks on competition day to enter. Sign up on the senior end of the hallway. Deadline to sign up is today. Sign up for the blood drive will occur yet today during lunch. The blood drive is tomorrow. Students who went on the Spanish Club trip to Cost Rica will be eligible to donate blood. Seniors, dress for the weather tomorrow for your workday at Sauder Village. No work gloves are needed. Testing continues tomorrow. English Part 2 will be for grades 7, 8, 9, & 10. Juniors, you are to meet at the main entrance by the offices at 8:15 tomorrow morning for attendance and loading the bus. Do NOT go to your first period classes. Pease review the handout you will receive today for appropriate dress and other details. 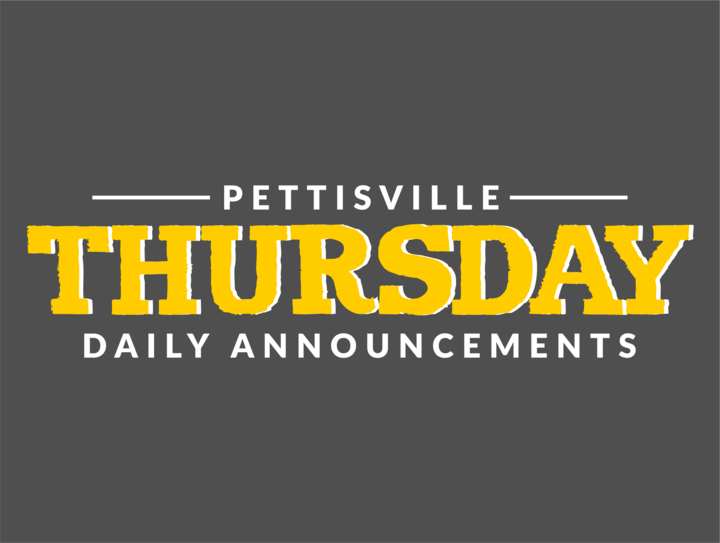 The varsity track meet, the varsity baseball game and the varsity softball game have all been cancelled for today. The NHS will be hosting a Mariokart tournament at lunch from April 23-May 4. Bring a new pair of socks on competition day to enter. Sign up on the senior end of the hallway. Deadline to sign up is tomorrow. There will be volleyball open gym tonight for girls in grades 7-11. Open gym will be from 7:15-8:45 in the varsity gym. Sign up for the blood drive will occur during lunch this week. The blood drive is on Thursday. Students who went on the Spanish Club trip to Cost Rica will be eligible to donate blood. The library will be closed today and Wednesday for testing. Congratulations to Keilah Fish and Kate Roth who received superior ratings for their solos at the Junior High Solo and Ensemble contest at Defiance High School last Saturday. Keilah earned a superior rating for her vocal solo, and Kate earned superior ratings on both her trumpet solo and her piano solo. Attention high school choir members: Please bring study materials to choir class period 1 this morning. You will have a study hall. There will be basketball open gym tonight from 7:00-8:30 for girls in grades 5-11. Girls – Team was 5th out of 13 teams. Meleah Plank was 1st in the high jump. Kendal Pursel and Elizabeth Rochefort were 2nd and 3rd in Pole Vault. Boys: Team came in 13th. Cayden Jacoby was 3rd in the high jump. Boys team was 7th out of 14 teams. Zach Morrison – 1st Pole Vault; Jaret Rychener – 1st High Jump; Graeme Jacoby – 2nd Shot Put.